Doolan Canyon Preserve Doolan Canyon Regional Preserve is a single square-mile parcel of land in Alameda County, in the foothills of the Diablo Range east of Dublin. Managed by the East Bay Regional Park District, the preserve is not currently open to the public, continuing for the time being in its historic use to graze cattle. There is a small man-made lake in the center of the preserve, fed by the seasonal Doolan Creek, with two ranked summits within the preserve boundary on either side of the canyon and another just outside to the north. Despite a forecasted 86F, I decided to pay the area a visit for a few hours. 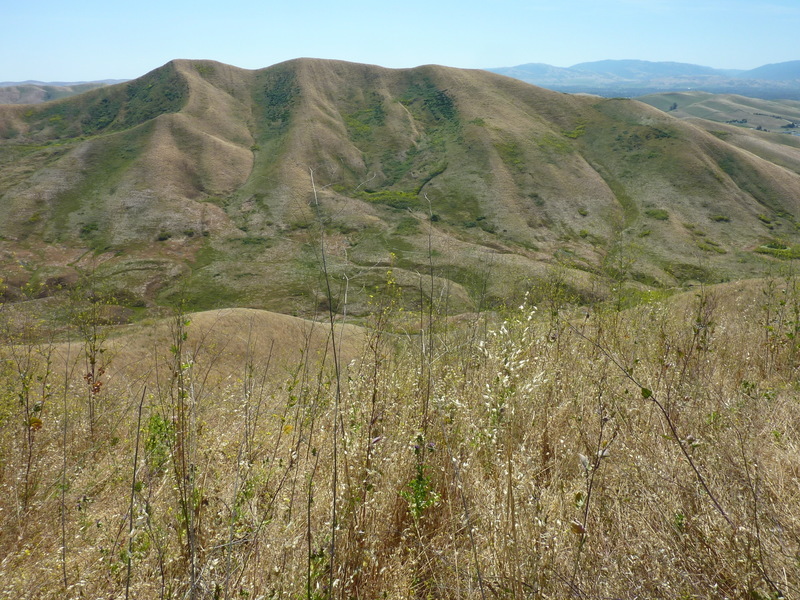 As Spring draws to a close, the Diablo Range is quickly losing the vivid green mantle that it had worn for more than five months, and I was hoping it might still prove inviting. I pulled up to the gated entrance to the preserve at the end of paved Doolan Rd not long before 9:30a and it was already quite warm. I was quickly revising my original plan, thinking maybe two peaks would suffice instead of the full circuit to all three. A good ranch road goes north through the preserve along the west side of Doolan Creek. There are no roads or trails of any sort going to either summit and I quickly learned that the more inviting green grasses were in short supply. In browning, the hills had become weaponized, essentially a vast sea of grass stalks armed with detachable stickers and thistles, aiming to expand territory by attaching to the various mammals roaming these hills, myself included. I'd been pushing my luck on the last few outings, but the Diablo Range was officially no fun anymore.